On Saturday morning, I got up bright and early to volunteer at the Run for Boston 5k. I'll be talking about that experience soon, but I had a great time. Afterwards I headed over to Lake Zurich to pick up my race packet and rack my bike. The goodie bag contained a lot of stuff which I was pumped about--Biscoff, bars, gel, and other samples. I didn't stick around too long at the expo because Matt was visiting so I wanted to get home and hang out with him. That night I laid out all my gear and packed it all up in preparation for an early wake-up call the next morning. 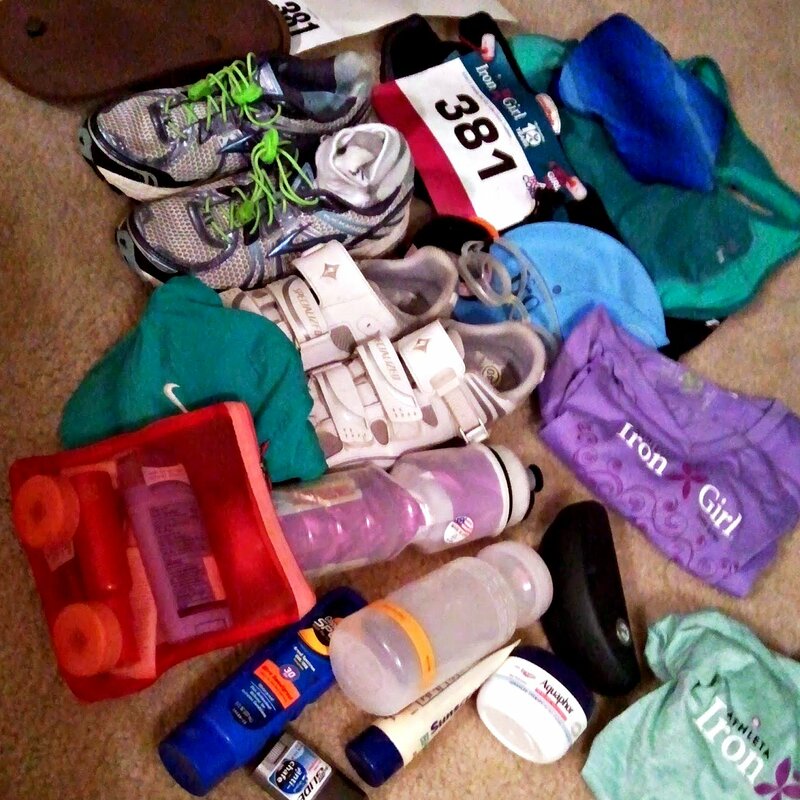 Triathlons require so much stuff. 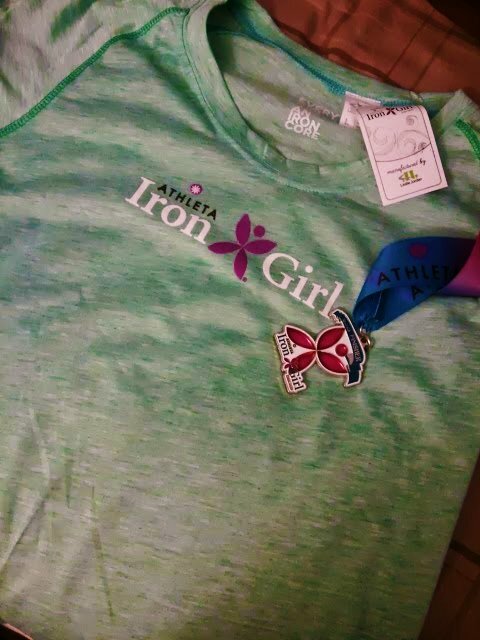 This race was not a "A" race for me and so I didn't purposefully taper, obsessively check the weather, or in general spend too much time worrying about the race. All of which are par for the course for me. After a fairly hard effort weekend at Ragnar, I had a lackluster training week. That being said, I still planned to race hard and woke up feeling great on Sunday morning. I rolled out of bed a little after 5 o'clock did the usual pb, banana, toast breakfast, braided my hair, and did a last minute check to make sure I had all my stuff. I let Matt sleep in the extra 15 minutes because I felt bad for making him get up in the 5 o'clock hour. I allotted about 30 minutes to setup in before transition closed which was plenty of time for this race, but I typically allot at least 45 minutes just in case something goes wrong. After transition closed I headed down towards the water start with Matt and tried to relax for a few minutes before putting on my wetsuit. The water was a comfortable 72 degrees but I opted for the wetsuit mostly because I paid a lot of money for that thing so I might as well use it whenever possible. I got in the water and swam maybe 100yds to warm up and remember how constrictive the wetsuit feels again. It does make it easier to swim though so that's a bonus. Kelly and I were in the last wave at 7:15 so we stood around and chatted while waiting. Matt, my triathlon sherpa and race photographer, took some pictures for us while we were waiting. After we were let into the water, I took up a spot on the very outside of the course. This way I can avoid most of the crowding and still make a direct line to the first turn buoy. My swimming times have improved greatly since starting triathlons and I probably should start much closer to the inside, especially at smaller races, but I'm more comfortable on the outside. The swim went well for me and the smaller field helped a lot in terms of crowding and getting hit and kicked, but I still managed to take a foot to the mouth. I got caught behind a breast-stroker and tried to cut to the left to get around her but underestimated the amount of space I needed and got too close to her foot. Thankfully, it wasn't too hard and I escaped with only a very slight swollen lip. So slight that it wasn't even noticeable to others and only I could feel it a little bit. Transition went off without a hitch and I headed out for the bike. Here's another insider triathlon tip*: run a few feet past the mount line before hopping on your bike to avoid crowding. So many other athletes stop right after the line to mount so running a few extra steps can save you time. The bike was fairly uneventful for the first half, but I did ride right by my office! I pushed hard in the first 5 or so miles and did a good job keeping my pace up even into the headwind, but I lost a little muster in the second 5 miles. I was passing a lot of people and was only passed by 1-2 people, but I think I should have been pushing harder in those middle miles. As we were riding into downtown Lake Zurich, I saw the woman right in front of me get hit by a car which was really frightening. I'm still not even sure what went wrong, but as the cyclist was moving through the stoplight intersection a car started going through the intersection from her right. The cyclist slammed on her brakes and flew over her handlebars. Two cops were standing at the intersection so like I said I don't even know what happened. Maybe there was miscommunication between the cop and the driver or the driver simply wasn't paying attention. I did get a chance to talk to the woman after the race (she was a friend of Kelly's) and she said she got up and finished the race. Her arm was scrapped and the car bumper slammed into her leg, but she was okay. Thank goodness! To everyone: please, please, please pay more attention to the road whether you are cycling, running, walking or driving! Transition 2 went really well and I quickly switched my shoes, my helmet for my hat and headed out for the run. I started running and my legs felt like dead weights, but I know that if I just keep running they will loosen up eventually. I grabbed some water at the first aid station soon after transition but the run was HOT and I wished I had used my handheld. After the bike ride, the run was thankfully uneventful. I didn't really have any idea how fast I was going, but just worked on picking off runners in front of me. I tried to pick it up for the last mile as my legs finally felt like they weren't just dead to the world. As the runners were rounding the corner to the finish line, a guy was standing there yelling, "You know you can catch the girl in front of you." So I really put the hammer down and managed to pass her in the last 200 yards or so. As we got closer to the finish line, I heard her coming up from behind so I really had to put the pedal down. In the end, I managed to out kick her! But ugh, that didn't make me feel good. They had cold sponges and a misting fan at the end of the finish line chute which was much appreciated. At first I was a little disappointed that I missed out on being top-3 in my age group, but as I looked at the results I've realized how much I've improved over the last year. Those paces are some of the best I've ever done in a race. And this was the first time I've ever ran sub-9 min/miles in a triathlon. In fact, my next best pace is 9:41 min/mile that I did at the Camp Courageous Sprint Tri last year. And my 5k PR pace is 8:41. That is a huge improvement! I should not be disappointed with my performance. After the race, Kelly and I hit up the breakfast buffet and waited our turn for the post-race stretch provided by Athletico. The post race food spread was pretty good--eggs, potatoes, turkey sausage, yogurt, and fruit. I was a little disappointed they didn't have cinnamon rolls only because Kelly had planted that idea in my head and it sounded delicious. The post race stretch felt AMAZING and it was totally worth the wait. And now I know I have a really tight left IT band. I better make friends with my foam roller again. We stuck around for the awards ceremony because Kelly snagged 2nd place in our age group! Another perk of staying for the awards ceremony, afterwards we were able to pick up an 8-pack of Biscoff jars. I think I'm set for awhile. Overall comments on the race. If you signed up early this race was a good deal, but I'm not sure I would want to fork over $95 (or up to $125 by packet pick-up time) for a sprint. The post-race breakfast was a nice bonus and there was a lot of swag which I would expect with that price tag. I really liked the course and this race was close to me which is always a bonus. The shirt is nice and comfy and fits me well. On the other hand, I am not a huge fan of races where you need to rack your bike the day before. I realize you most likely have to go on-site to pick up your packet anyways, but it seems like more a hassle to me. I really wished there was another water station on the run course because I was really thirsty at mile 2. Although 2 water stops on a 3 mile course should be plenty, it was already hot by 9 am that day. I'm not sure how I feel about all-women races. I'll all for women-power and all that, but I don't think women need their own separate races because they can and do compete with the men. This probably deserves a whole post in itself, but I thought it was worth mentioning here. That all being said, I will probably consider signing up for this race next year, but I will make sure to register early if I do. I do want to give a special thanks to Matt for being an extra awesome sherpa. I can't imagine it is fun to carry around all my crap while I race. I hope the jars of Biscoff kind of make up for it! *I feel like I'm giving away all my secrets in this post and now I'm going to be upset at the next triathlon when everybody is in my usual spots. Oh, who am I kidding, not very many people read this. 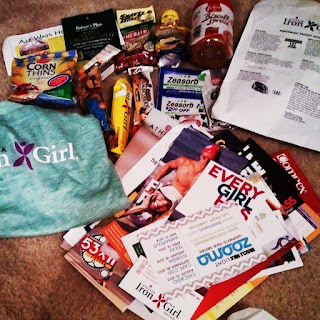 Disclosure: I received a free race entry for the IronGirl Lake Zurich as an ambassador. All opinions are my own.